Back to this race, after nine years away. When I entered, rashly, I imagined an early spring day on Brighton seafront, soft sunshine, a light breeze at most. What did I find? Cold fog at the start, a chilly wind, Doris’s last gift to us, and a tough race. There are running bloggers I know who can work miracles with their words and who isolate and describe the essence of every run, writing as if sired by Hemingway out of Hunter S. Thompson. I can only offer a chronological account, without any great themes. I rose at 6, ate porridge and toast with some Greek honey, a present from my daughter. I left the house at 7:15, worrying about finding a parking place in Brighton. As I drove, I listened to the latest episode of In Our Time, in which Melvyn Bragg and guests discussed Seneca. This seemed appropriate preparation. The best way to approach a half marathon is with ἀπάθεια, apatheia, a state of mind in which one is indifferent to passion and suffering. Seneca wrote bloody tragedies, and ended his life by his own hand. I seized the first parking place I could find. I had planned to then take coffee at Ground Coffee in Kemptown, but was thwarted, as it doesn’t open until 8.30 on a Sunday morning. No matter. I had read, marked and inwardly digested the advice of the International Marathon Medical Directors Association. who enjoin runners to drink no more than 200 mg of caffeine before a run of 10k or more . I returned to my car to gaze at yesterday's Guardian prize crossword, leaving for the race at about 8.20. I went down Duke’s Mound to the baggage area. There were thousand of runners, warming up, seeking secluded places to answer calls of nature, taking selfies, worrying. This race was so unlike those I am used to. At cross-country events, I know the rest of the field by sight, if not by name. There are rarely more than a few hundred entrants. Brighton being Brighton, this was more like Glastonbury in lycra. We were blasted with music, at times too loud. I found my place, a little way behind the 2:15 pacemaker’s banner, and waited for the off. When that moment came, we shuffled forward slowly. I don’t think we passed the start line until ten minutes after the advertised time of 9 o’clock. Progress was slow, with runners of all paces trying to find space to run their race. I stuck with the 2:15 banner, out away from the coast to St Peter’s church and then back. The first miles always pass quickly. Before I knew if we were back on the seafront, running along the A259 on my homeward route from work. A drinks station, too soon for me to have a thirst, but I took a pouch. Out towards Roedean and Ovingdean. I saw faster runners I knew coming back as we headed east: Josh Rudd and Luke Borland looked strong. Six miles in, the pacemaker was ahead of me. I counted the gap: about two minutes. I’d be happy with that. I haven’t done a half marathon in under 2:17 since 2012. By this point, I felt strong, but little niggles were making their presence felt. My knee tonged, my feet hurt, my ankles were not as they should be. The run along this stretch, the central part of the seafront, was well supported, and this always lifts the spirits. But I knew how far west we had to go, to Hove Lagoon. After Hove Lawns the support is lighter, and I began to hate the tarmac. Why could we not run this on some sheep-nibbled down? The turn at the lagoon lifts the spirits, though. From this point on I knew that I would finish, and that the finish would still be in a decent time. Back we went, along that part of the promenade familiar from the Brighton Marathon, the Hove Prom 10k and the Phoenix 10K. By this point everything was hurting at once; this is helpful, because it stops one obsessing about a particular body part. ‘Listen to your body’, some earnest runners pontificate. I’d rather my body kept itself to itself. Between miles 11 and 12 I had a very hard time. This was a pity as my supported, Mrs R, son Will, his partner Jemimah, and grandson Teddy were by the i360. They saw me, but I missed them. They said I looked unhappy, But at mile 12 I received, and upped the pace. By the time we passed the Palace Pier I was going well, and passing runners. I spotted the mighty Sweder in the crowd, who captured my efforts on camera. I managed a surge towards the line and finished in a very satisfactory 2:22:01. Nothing like the 1:43:14 of 2005, but I was younger then. 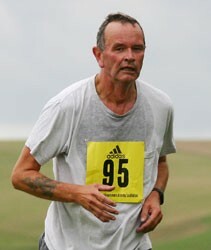 Next, the Seaford half marathon in May. I offer you some photographs, and am grateful to Ash (aka Sweder) and Mrs R for these. There is but one week to go before the Brighton Half. In a week’s time I will be relaxing with my first alcohol for four weeks, while those around me top up my glass and feed me the choicest and daintiest food to be had in the whole of Sussex. This was a good week; I ran two three miles in the week, a parkrun on Saturday and six and a half miles today, which is probably about the right level of effort. I shall take next week easy too, so as to be like a coiled spring on the start line at 9 am on Sunday 26th February. As for today, I went out towards the Cuckmere and around. Encounters of note including many lambs on the hill Seaford Striders call Sheep Hill, and a party of German tourists puzzled by a stile. I urged them on, trying to explain it in my limited German, but the verb for to climb deserted me — afterwards I thought aufsteigen might have done the trick. The language of gesture seemed to suffice. 7 days till the Brighton Half. This was a good week; using up some annual leave, I had four days at home, allowing two five mile runs, and two swims, rather than the customary one. The first five miler, over Seaford Head, took place in mild weather on Tuesday, but then the cold weather started. Thursday’s seafront run took place in temperatures of 2°C, while a return to Bevendean Down for a Saturday parkrun, in the company of Rob Read, saw snow. The week climaxed with a bitterly cold, muddy and hilly cross-country race on a new course, in Heathfield Park. Heathfield Park was laid out by Humprey Repton, who doubtless foresaw that his landscaping would provide features of interest for runners in centuries to come, to wit streams of freezing water, long ascents up muddy tracks, and, the coup de grâce for many of us, a steep and slippery descent into a valley, a stream to leap and an equally steep and slippery ascent on the other side, within the last mile. This was a character-builiding run, and I hope that hard cross-country will prove suitable preparation for an urban half-marathon. As for the rest of the week, I participated in the first birthday of the Bevendean Down #parkrun on Saturday, breaking my no-running-on-consecutive-days rule, and ran a five-miler with the Striders on Wednesday. 21 days till the Brighton Half. I’m running the Brighton Half for the Stroke Association. Find out more and sponsor me - and thanks for all the donations that came in this week.